KADUNA- The Group Managing Director of the Nigerian National Petroleum Corporation, Dr Makanti Kachalla Baru Wednesday said with the release of staff of corporation captured while exploring oil in the lake chad basin, it will return “with full force” to continue with exploration activities in the basin. The GMD disclosed this at the NNPC Day at the on going 39th edition of the Kaduna International Trade fair. According to the NNPC boss, the corporation has also intensified exploration activities in the Benue trough, adding that there are prospects for oil in four locations in the region. He said the corporation will explore for oil in Benue, Nasarawa, Niger and Sokoto states, adding that with what the corporation has seen so far, it was sure that “success is ours”. “On the lake chad oil exploration, we have been working tirelessly and we thank the president for rescuing some of our lecturers that were involved in the exploration in the region. We are going back to the chad basin with full force” he said. 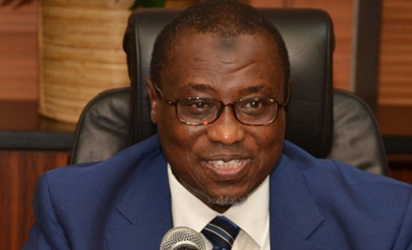 Baru said though oil and gas industry has been the main sustainer of the Nigerian economy, providing 95 percent of the nation’s foreign exchange, “the main challenge in the country’s monoculture is that it exposes the nation to the vagaries of oil price volatility, which during a period of glut could spell doom for the country’s economy. While emphasizing the need for diversification of the country’s economy, Dr Baru said “the feat achieved decades ago in mining, agriculture and commerce which even sustained the economy of each region of the country can be replicated if we rechannel the country’s productive sector”. He said the NNPC is poised to provide enabling environment for the nation to optimize its commercial, industrial and agricultural potentials to attain competitive edge in these sectors. This is a commitment which we shall continue to abide by. “To demonstrate our commitment, NNPC has set up the Renewable Energy Division that is focused in not only developing solar and other renewable energy sources but also in the development of of Biofuels that are heavily dependent on agricultural produce as feedstocks. The multiplier effects in such ventures are enormous: reviving the and revitalizing our agricultural sector, huge employments generation in millions, significant contributions to power generation, high volume of animals feed, starch and by products in addition to biofuels that will be blended to our refineries petroleum products that will significantly reduce imports of petroleum products into the country” he noted. He said the country needs to focus on undertaking holistic policy action towards rebuilding the nation’s infrastructure which he said are not in the best form. He said the NNPC has taken steps to ensure that recent hiccups witnessed recently are over come. Some of these steps include the full deployment and activation of 24 hours real time fuel war room for effective monitoring of fuel supply and distribution dynamics across the country; sustenance of 24 hours loading and sales operations in all depots and mega stations and collaboration with and sharing information with the oil industry regulators and other agencies in the ministry of Petroleum Resources. In his speech the representatives of the Kaduna Chamber of Commerce, Mines and Agriculture, Alhaji Tijjani Musa said the economic diversification efforts of the federal government has started yielding results as the country is already self sufficient in rice production. He suggested that attention should be given to other crops like cotton, groundnuts, wheat,rubber palm oil and others, adding that this will not only minimize chronic unemployment but will enhance commerce and industrial activities. The post We will go back to Chad Basin with full force- NNPC appeared first on Vanguard News.